You'll sling hay in 95 outrageously fun levels, tend to 30 wacky animals (including walruses and llamas) and purchase more upgrades than there are ears in a field of corn! What's more, as you grow crops, feed animals, collect produce and manufacture goods, you'll be treated to some of the zaniest animation to ever grace a casual game! 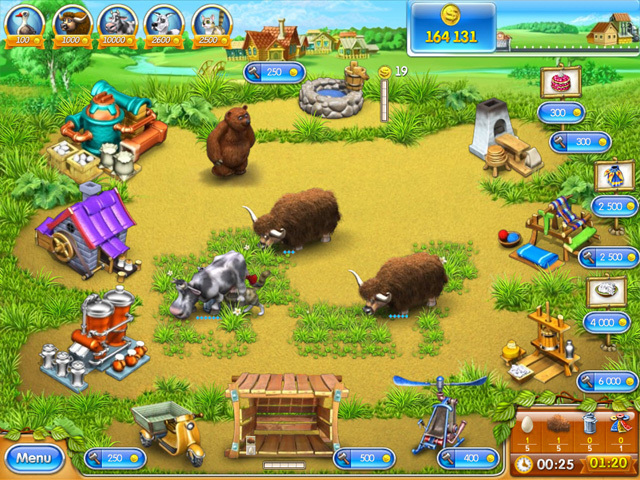 While challenging, Farm Frenzy 3 is more balanced than earlier installments of the series. You can breed birds instead of buying them, for example, and dress the bears you catch in silly outfits and sell them for more money. Qweas is providing links to Farm Frenzy 3 2011 as a courtesy, and makes no representations regarding Farm Frenzy 3 or any other applications or any information related thereto. Any questions, complaints or claims regarding this application Farm Frenzy 3 2011 must be directed to the appropriate software vendor. You may click the publisher link of Farm Frenzy 3 on the top of this page to get more details about the vendor.